This week I wanted to make an apple pie. One with a full case - shortcrust pastry around the bottom and puff pastry on the top (rough puff preferably.) When I started poking around my cook books though I found I didn't have a recipe that even came close. Searching the Internets came up pretty unsatisfactory too - the recipes were either overly complex or used the wrong sort of pastry. 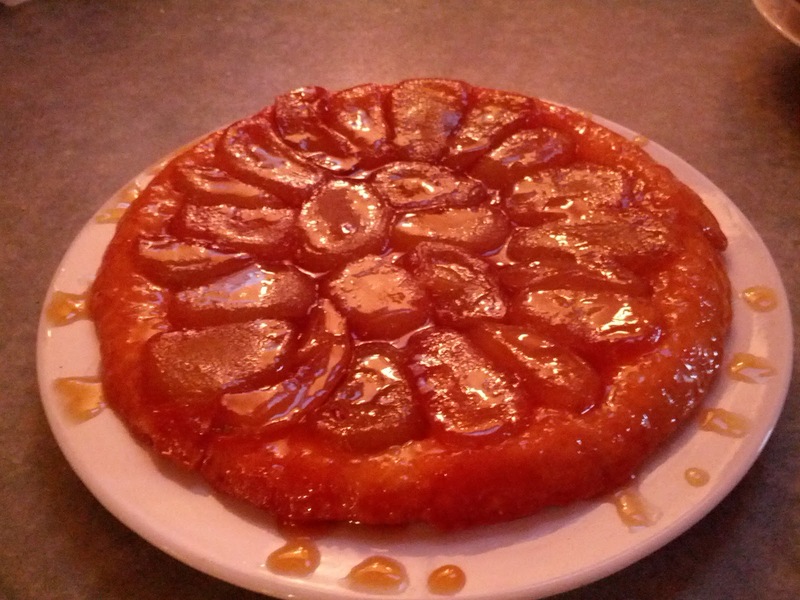 After venting my frustration (OK, mentioning in passing that I was having no luck) Rachel suggested that I just make a Tarte Tatin instead. I've previously made the one from the Phaidon text The Art of French Baking but was disappointed in the result (as with so many recipes I've made from that book) so I went back the Internet again. Fortunately the Taste website very quickly presented me with a pretty promising recipe. So, here it is, adapted from taste.com.au. To make pastry, combine flour and sugar in a bowl. Add butter and rub into flour and sugar using your fingertips until mixture resembles breadcrumbs. Make a well in the centre and add egg and 2 tsp iced water. Using a dinner knife, combine until a rough dough forms, then, using your hands, bring together until it forms a ball. If it's still crumbly add another 1-2 tsp water. Shape into a disc and wrap in plastic wrap. Refrigerate for 30 minutes or until firm. Don't overwork pastry or add too much water otherwise it will toughen and shrink when cooking. Meanwhile, peel each apple and cut in half, then cut each half into 3 wedges and cut out the core. Melt butter in cast-iron frying pan over low–medium heat. Stir in the sugar to mix. Cook, swirling pan occasionally, for 5 minutes or until the mixture is bubbling (don’t worry if the sugar looks crystallised in the pan.) Remove from heat and place apple wedges in 2 neat, concentric, tight-fitting circles over base of pan. It's important to tightly pack apples into the base of the pan, even if you have a few overlapping. The apples will reduce in size when cooked. Return pan to medium heat so the liquid bubbles and cook for 15 minutes. Remove pan from heat and cool for 10 minutes. Preheat oven to 180C. Roll out pastry on a lightly floured surface so it's round and about 4-5mm thick. Cut into a neat circle about 1-2cm wider than your pan's base. Place pastry over cooled apples and push gently down with a wooden spoon around the edge of pan. That extra bit forms a wall around the tart when it's inverted. Bake for 40 minutes or until pastry is deep golden. Cool in pan for 10 minutes, then turn out onto a large plate. Allow to cool further so the liquid sets a little. Serve warm or at room temperature with creme fraiche or vanilla ice-cream or just as it is. Note that in my photo above you might be able to see that the pastry was cut too large and ran back up the sides of the pan. In hindsight I should have trimmed it further once it was in the pan and I could see it was too big.